Dallas Cowboys defensive tackle Jason Hatcher warms up before an NFL football game against the Philadelphia Eagles, Sunday, Dec. 29, 2013, in Arlington, Texas. Defensive end Jason Hatcher said not making the Pro Bowl did not fuel his fire Sunday night. Hatcher said his teammates motivated him to have a big game, finishing with two sacks and a forced fumble. Hatcher has turned in his most-impressive season during a contract year, totaling a team-high 11 sacks. But as much as the 31-year-old has enjoyed playing in Dallas, don’t expect him to take a pay cut to remain a Cowboy. 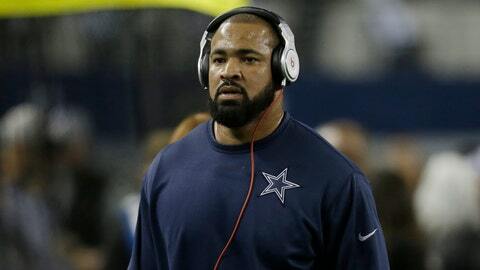 Sitting at his locker late Sunday night, Hatcher said he will "absolutely not" allow the decision to become emotional. "This is business," Hatcher said. "Emotions are out of it." Does he think he’ll be back next year? "I don’t know, man. My feelings are just, I’m numb right now," Hatcher said. "Whatever happens, happens. It’s up in the air, I really don’t care whether I go or whether I stay. It’d be awesome to stay here and finish my career here, but if not, I have to move on. It’s a business. You can’t get any emotions involved or you’ll find yourself in a bad situation." If Sunday was his last game in Dallas, Hatcher wanted to pass along a few words to the Cowboys fans. "If I don’t return next year, I really thank you guys for supporting me, my family and everything I stood for, the ups and downs here," Hatcher said. "We’ll see what goes on in March."